Axiomtek has introduced rBOX101-6COM (ATEX), the world’s first ATEX certified, rugged intelligent DIN-rail fanless embedded computer system. It is equipped with an extra low power Intel Atom processor Z510PT or Z520PT, six isolated COM ports, isolated digital IO as well as wide range temperature support. The rBOX101-6COM(ATEX) was also awarded the 2014 Taiwan Excellence (The Taiwan Excellence Awards is delivered by the Bureau of Foreign Trade, Ministry of Economic Affairs (MOEA) and Taiwan External Trade Development Council). The system has an ATEX anti-explosive certification making the unit more reliable and stable in potentially explosive environments and quick access to more than 450 million citizens of the world’s largest single market -the European Market intended for use in potentially explosive atmospheres in explosion-proof equipment, and also sell for outside of Europe under the international trade of IECEx mutual certification system, unlimited business opportunities. To withstand extreme range of working temperatures, this durable unit can perform in temperatures ranging from -40°C to 70°C. The robust DIN-rail fanless embedded system has a compact form factor and IP30 housing, making it ideal for both indoor and outdoor industrial applications such as power plant automation, facility monitoring systems, intelligent transportation systems and much more. "To fulfill different application needs, Axiomtek’s super compact rBOX101-6COM(ATEX) comes with ATEX anti-explosive certification and many safety compliances, complete expandability up to six isolated COM ports and so on," said Eric Chiang, product manager at Axiomtek. "Its front accessible I/O cabling is convenient for wiring and maintenance. This ruggedized din-rail embedded system is set out to be a total intelligent computing and communication solution in critical environments such as power utility, gas station, refinery, mine and more fields." To prevent ESD and over-voltage, this robust unit is equipped with six isolated COM ports (RS-232/422/485), one isolated 10/100/1000Mbps and one isolated 10/100Mbps Ethernet ports as well as one isolated DIO (4-IN/4-OUT) port for offering magnetic isolation protection. The IP30-rated system already obtained the ATEX anti-explosive certification which can be used in potentially explosive environments. In addition, it meets many safety requirements to provide higher operational reliability and stability such as UL508, Heavy Industrial CE, FCC Part 18, UL/cUL60950-1, IEC60068 and EN50121-4. 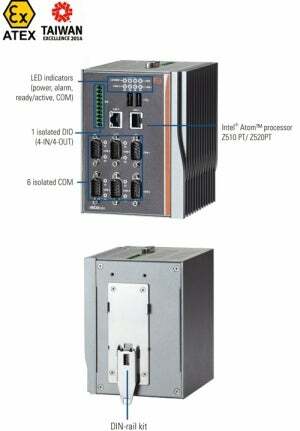 The ready-to-run computing system rBOX101-6COM(ATEX) with intelligent AXView package is available now.